(from left) Dr. Modjtaba Sadria, Shiraz Allibhai and Dr. Nasser Rabbat. The topic of a recent forum “Culture and Identity,” enticed me into examining the concepts. Culture is a very broad term and includes all the behaviour patterns, arts, beliefs, institutions, as well as other human work and thoughts passed on from one generation to another. Thus culture is behaviour that is learnt. Identity, on the other hand, answers the question, “Who am I?' and relates to one's position in one's nation, society, culture, family and so on. It has been suggested that we have multiple identities depending on our relation to these above named areas. Thus we have national identity, social identity, cultural identity, etc. Through traditions, history or simply through learning from one's surroundings, we form our own cultural identity. It is this that gives each person her of his distinctive individuality. The strong bond between culture and identity is, however, slowly disintegrating due to globalisation and mass migration. 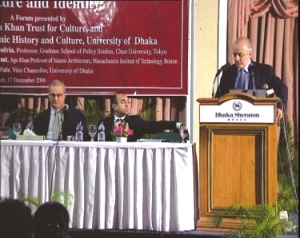 A “Forum on Culture and Identity” was held on 17 December 2006 at the Dhaka Sheraton Hotel. The event was jointly organised by Department of Islamic History and Culture, University of Dhaka, and the Aga Khan Trust for Culture (AKTC). The AKTC, founded in 1988, is an integral part of the Aga Khan Development Network (AKDN), a family of institutions created by His Highness the Aga Khan, with distinct yet complementary mandates to improve the welfare and prospects of people in countries in the developing world, particularly in Asia and Africa. It is a private, non-denominational, development agency whose main agenda is the improvement of built environments in societies where Muslims have a significant presence. This forum was part of the AKTC's 2007 International Fora series. Since its opening in 1921, the University of Dhaka has been trying to provide quality education to its students. The then vice chancellor Sir P.J. Hartog along with a few new teachers had opened the institution in the Ramna area on 600 acres of land. The university, through time, has gained international fame and currently has more than 30,000 students enrolled, taught by nearly 1,300 able and dedicated teachers. Shiraz Allibhai, the Education Programmes Coordinator for the AKTC, gave a presentation on, "Plurality and Ethics through the Work of the Aga Khan Trust for Culture". He shed light on the works of the AKTC and its alliances and emphasised the importance of culture and identity in the modern world. According to Shiraz Allibhai, “Culture speaks of who we are, where we have come from and where we are going.” Allibhai, also acts as the managing director of ArchNet, an international online community developed at the MIT School of Architecture and Planning and the University of Texas at Austin, School of Architecture, in close cooperation with the AKTC. ArchNet is a vast global society of teachers, students, researchers and professionals concerned with architecture, planning and landscape design. The website gives the members access to a broad range of architectural resources, give new and different perspectives on the built environment, and provide insight into Islamic design and culture. The idea of such a community is to help one another by sharing knowledge, skill, local experience, resources and discussions. By providing the largest and most comprehensive digital library on the architecture of the Muslim world, ArchNet aims to foster interaction, collaboration and debate around these resources. At present ArchNet has over 41,000 members with 9,000 people visiting the website on a daily basis. The keynote speech entitled, “Muslims: Actors or Victims in Contemporary World?” was given by Dr. Modjtaba Sadria, an Iranian-born philosopher and a Professor of the Graduate School of Policy Studies, Chuo University, Tokyo. He is also a specialist in cross-cultural relations and East Asian studies, and has published over 50 books and articles. He was a member of the 2004 Aga Khan Award for Architecture Master Jury and currently sits on the Steering Committee. He spoke of contemporary Muslims in the modern world and the role that they are playing. At a time when expansionism and aggression by large nations is prevalent, the question to what extant contemporary Muslims are the makers of their place in the world, or the victims of it, is of utmost importance. The next keynote speaker was Dr. Nasser Rabbat, Aga Khan Professor of Islamic Architecture, MIT, Boston. In his speech titled, “Toward an Intercultural Model for the Study of Islamic Art and Architecture,” he speaks of how the study of art and architectural history has only recently begun to question the validity of religious and cultural boundaries as disciplinary frameworks. It had long been burdened by the limitations of a number of obstinate concepts such as hierarchy and cultural segregation. According to Dr Rabbat, contemporary scholars have been looking at the fluidity with which creative ideas and techniques have crossed boundaries throughout history with respect to art and architecture. His paper explored, “the use of some of these new investigative trends, which can collectively be termed the intercultural model, in the study of Islamic art and architecture.” He also re-examined “the history of the discipline, which has rarely been examined within its historical, cultural, and ideological contexts.” He proposed a “dynamic and multi-referential historical framework, with chronologically open-ended boundaries that accommodate overlaps with other cultures and emphasise the cultural diversity within the Islamic context.” It is only with such critical revisions that the field can begin to occupy its rightful place as an active and contributive component of world art and architecture. the first of its kind, and both now responsibilities of the Trust for Culture. They are the Aga Khan Award for Architecture, established in 1977, the world's largest prize for architecture, and the Aga Khan Program for Islamic Architecture at Harvard University and the Massachusetts Institute of Technology, a specialised programme of professional and graduate studies and research established in 1979. Their activities have generated knowledge about contemporary and historic buildings, professional education, the cultural and economic dimensions of built environments, and a network of architectural professionals, scholars, and administrators specialising in the Muslim world. The second part of the Forum consisted of the panel discussion, where scholars as well as Dr. Anisuzzaman, Professor in the Department of Bengali, University of Dhaka; Dr. Shayer Ghafur, Professor, Department of Architecture, Bangladesh University of Engineering and Technology; and Mr. Aly Zaker, actor and theatre activist, all took part. The dialogue was moderated by Dr. Firdous Azim, Professor and Chairperson, Department of English and Humanities, BRAC University, Dhaka. Professor S.M.A. Faiz, Vice Chancellor, University of Dhaka, was present at the forum as the chief guest while Dr. Perween Hasan, Professor, Department of Islamic History and Culture, University of Dhaka, read the welcoming address. The answer to the question, “Who am I?” may still remain a mystery to some of us and globalisation and mass migration are in no way helping to answer that question. However, throughout history, Muslim architecture has successfully shown the fusion of the two crucial concepts of culture and identity not just for particular groups but worldwide.